The present volume is an attempt to bring serious critical scrutiny to bear on an author whose works in the field of fantasy horror, though they have enjoyed various kinds of popularity, have heretofore been afforded relatively little attention in the realm of literary criticism. H.P. Lovecraft was not only a writer of highly worthy and unique stories, novels, and poems; he was a philosopher of genuinely incisive perception, an essayist of much persuasive power, a literary critic, and an epistolarian whose equal is scarcely to be found. However, the present study shall, of necessity, focus on Lovecraft the writer of fiction as illuminated by his works, his self-criticism in his many letters, and the literary influences that helped shape him as a fantaisiste of the first water. Like Poe, Lovecraft is a deserving writer whose emergence as an accepted and admired artist has been slow in coming; but come it must. H.P. 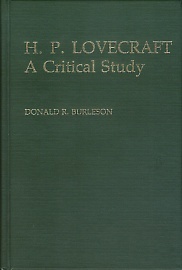 Lovecraft: A Critical Study. By Donald R. Burleson. Westport, CT: Greenwood Press; 1983; ISBN 0-313-23255-5 (library binding). This book may be purchased in hardcover from Amazon.com or Barnes & Noble.